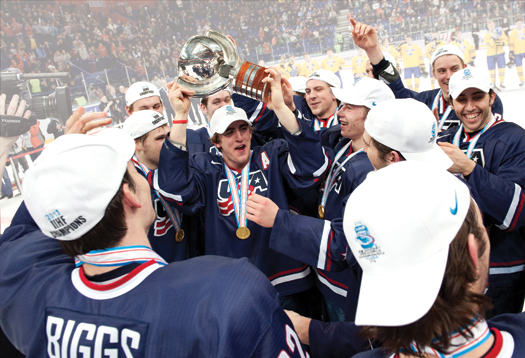 Cole Bardreau is mobbed by his teammates while hoisting the championship trophy following a 3-1 victory over Sweden in the gold-medal game at the 2013 IIHF World Junior Championship. As questions and comments circulated throughout the hockey world like the Russian snow swirling outside Ufa Arena, all was quiet inside the Team USA bus. Another disappointing one-goal loss left this American squad on the precipice of a second consecutive disappointing run at the IIHF World Junior Championships. As the 23 players sat in silence wondering what it would take to rally, Phil Housley stepped into the aisle to address his troops. A veteran of many such bus rides during his Hall of Fame career, Housley is no stranger to these make-or-break moments. And in the words that followed, he did more than simply brighten the mood of a dejected group. He injected confidence into a lineup that he believed was on the cusp of greatness. All they needed, he felt, was not an overhaul, but a gentle nudge. As he returned to his seat, smiles slowly returned. And just like that consecutive one-goal defeats at the hands of the Russians and Canadians were softened. And just like that Team USA had a new life. 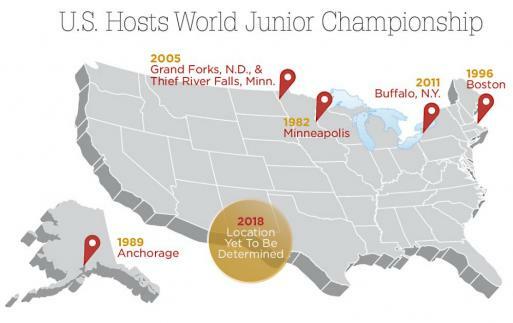 It would turn out to be the last time the U.S. squad would taste defeat at the 2013 IIHF World Junior Championship. They easily survived their do-or-die match up with Slovakia, 9-3, to escape the preliminary round, and then dispatched the Czech Republic, 7-0, to set up a rematch against their North American rivals. This time around there would be no doubt as a pair of goals by defenseman Jake McCabe and Johnny Gaudreau powered the U.S. into the gold-medal game with a 5-1 victory. In a do-or-die preliminary round game against Slovakia, the U.S. National Junior Team dominated from the opening face off to win, 9-3, to stake a claim to a spot in the quarterfinals. Bardreau then paid Housley and his coaching staff – Mark Osiecki, Grant Potulny, Dave Lassonde and Dan Muse – a compliment that rang throughout the U.S. lineup and is perhaps a hallmark for how to guide hockey teams from Mites to National Teams. Housley admitted later that he didn’t make big changes after the two losses because that wasn’t what was needed. “The pieces came together, and I think that’s what you have to look at,” he said. “Don’t change something to change something but look for the positives on your team and make small adjustments not big ones. It’s not that Housley didn’t make changes on the fly. He split up the defensive pairing of Seth Jones and Mike Reilly for new partners. Jones joined McCabe, a shutdown defenseman who had suddenly discovered a knack for finding the back of the net, and Connor Murphy shifted over to join Reilly. The move freed up Reilly and Jones to be more offensive and helped lead to a burst of offense from the defensive core. 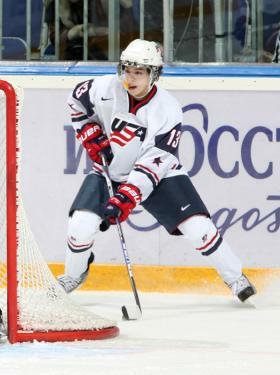 Johnny Gaudreau, above, added to his impressive championship resume with a gold medal at the World Juniors. Housley also sent out the high energy "Grind Line" of Bardreau, Blake Pietila and Ryan Hartman for important shifts. That’s an understatement as evidenced by the glut of goals that helped pave the way to the gold-medal game against Sweden. Gaudreau, a 5-foot-9 puck wizard from Boston College, went from zero goals entering the Slovakia game to seven after beating Canada in the semifinals. He scored two goals against Slovakia, three against the Czech Republic and two more against Canada. He finished with seven goals, two assists and was tied with two others for the team lead in points with nine. “Throughout the whole tournament even with a couple losses the coaches told us to follow the system. Just to play our style of hockey and it became better and better,” said Gaudreau, who is the only player to win a USHL, NCAA and World Junior title. Housley said his confidence with the team that was born in early August during a training camp in Lake Placid, N.Y., came from what he saw from the net out. He had grown close to these players and knew that they had what it took to push through adversity. And in the end his players rewarded his trust by leaving it all on the ice. He pointed to goaltender John Gibson as a catalyst for keeping the team calm during the storm. Gibson posted a sparkling 1.36 goals-against average en route to the tournament MVP award and the Directorate Award as the best goaltender. Soon after Vince Trocheck’s empty net goal iced a 3-1 championship victory, there was an outpouring of emotion on the USA bench, as players, coaches and staff celebrated the third World Juniors gold in USA Hockey history. All that was left was the handing out of the championship hardware. In addition to Gibson’s haul, Jacob Trouba was named the tournament’s best defenseman, and McCabe and Gaudreau joined both teammates on the Medi All-Star Team. One player who didn’t end up on an all-star team, but was one of the team leaders on the score sheet and in the locker room, was assistant captain Seth Jones. The 2013 NHL Draft eligible defenseman finished fifth on the team in scoring (1-6-7) and was among the first to hoist the championship cup. He praised Housley for keeping the boat from rocking during the early part of the tournament or even when the team went down a goal like it was against Sweden in the gold-medal game. “Any time you get down a goal or two, if the coach believes in the system, it makes you believe in the system and everyone else believe in the system,” said Jones who is expected to be one of the first players drafted this spring. John Gibson came up big throughout the tournament, including an incredible save against Canadian star forward Ryan Nugent-Hopkins. Housley said the short tournament doesn’t provide a coach a lot of time to make massive overhauls, and since he didn’t see major problems he wanted to keep the players focused on winning key games, not all of them. In his closing speech to his team in the locker room following the gold-medal victory Housley told them how proud he was and in similar, brief fashion to his speech on the bus wrapped the tournament with one final message. “You played your hearts out and made my job look a whole lot easier,” he said as his team whooped and celebrated.